More pics to come after tonight's adventures! Be safe and have fun! Here is a card I made for my son, using the "Buds and Vases" jar and the little haunted house and pumpkins from Asela's "Boo!" I was inspired by a little shaker globe with a a ghost and bats in it at the drug store and saw how easily I could recreate it with these images! The house and tree fit perfectly in the jar. Pumpkins are colored and cut out, glued over the image. Although a clear jar wouldn't like "white" on and black background, I like the contrast and thought the large black layer was perfect for a spooky night. Hello! Here we are with our fourth and final guest spot with Giovana for my "Buds and Vases" set! (The month went really fast, no?) 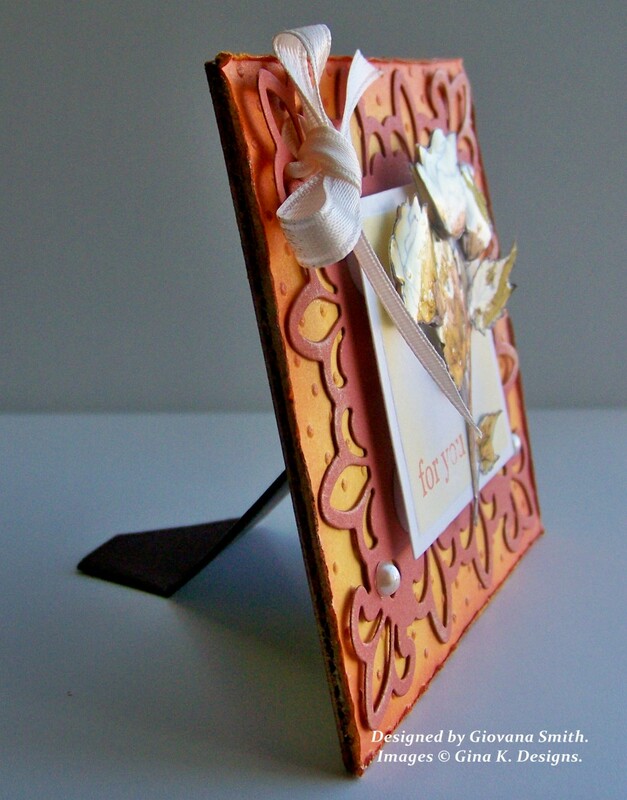 Today Giovana's created a pretty little art frame in these dazzling fall colors! "The frame is 3.75" square. I recycled some cardboard from computer boxes. I Cuttlebugged a piece of mustard cardstock, sponged all edges in Rust Ink then distressed them. I die-cut the biggest frame from Fleur de Lis and adhere to the frame. I also die-cut a square white piece and stencil it. Added to the frame with foam tape. Finally I stamped the sentiment and image, colored it with Copic Markers, and covered it with Crystal Lacquer. After drying, I cut it out and popped it up on the frame, then added pearls and ribbon." 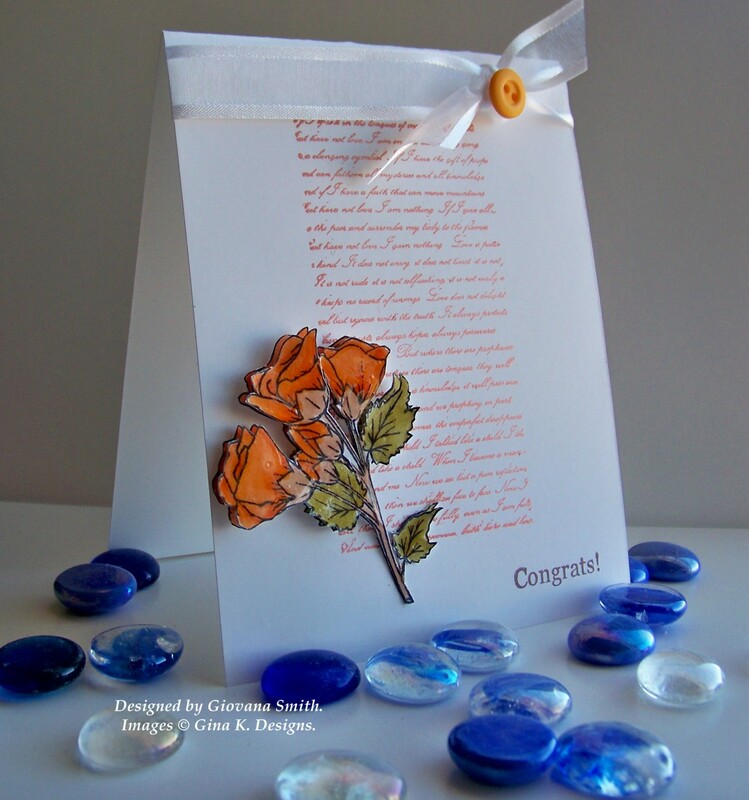 Thanks Giovana, for all your beautiful designs with "Buds and Vases" this month! Now let's go see another project on her blog! Here's a fun little card using the jar from "Buds and Vases" and Gina's "Happy Haunting" spider, the web and spider fit perfectly into the corner! Sorry I didn't get more Halloween samples done for you sooner, but better late than never! And I do have a quickie tutorial to show you how to make cute toppers for the jar like little fabric covers, you can do with this different seasonal prints for your jar year round! First find a piece of patterned paper you like and flip it over. Now stamp the top of the jar, here inked up in Memento London Fog, on the back. Take a pen or pencil and make straight sides on either side of the mouth of the jar. Kick the line on either side at an angle and then an zigzag line below the rim. Making the zigzag uneven will make the gathers and pleats look more realistic. Here it is over the jar. Now just add some twine or ribbon to look like it's holding the "fabric" over the top. Patterned papers are Basic Grey Pyrus. Hope this is helpful to you! I'm looking forward to making some pretty Christmas-y toppers this way for my jar with Basic Grey Jovial papers, then filling them with fun holiday images, cookies etc! Sorry I've been a stranger, my boys are recovering form sinus and ear infections and I am recovering from laryngitis and eye infections! i have a lot of catching up to do for creating nd posting, as well as getting all my samples done for our next release, sneak peeks starting on Monday night, party next Thursday November 4th! I also need to make some cards for the Hope You Can Cling To challenges over at SCS, I am sponsoring their giveaway with some stamp sets so I hope you all are playing along when you can! Ok, off to try to get some work done! I pray you are well and good but if not heal up soon! The thank you greeting inside is from "Hip to be Square" set. 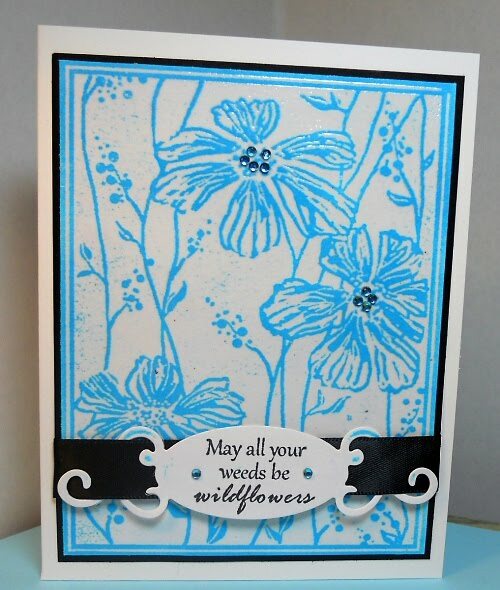 "For this card, I dry-embossed the front of the card (Distressed Stripes), then sponged it a bit. I stamped both leaves 16 times, colored them with Rust Pearlscent Ink using a sponge. I cut out a circle using Circle Nestabilities to have as a base for my wreath, then I assembled first the small leaves and then I added the big ones. After that, I added some Gold Stickles around the edges of each leaf and put some Gold Gala Glitz (this is a mix of tiny beads and glass) on top. " Well! Are you as intrigued with how GORgeous that "Gold Gala Glitz" is as I am?? Anyway, I'm just in love with this card and this look! I also just noticed as I typed those little row of dots she did on just one side of the thank you, perfect! Little unexpected details like these just make a card so special! I keep noticing more things to like about it! 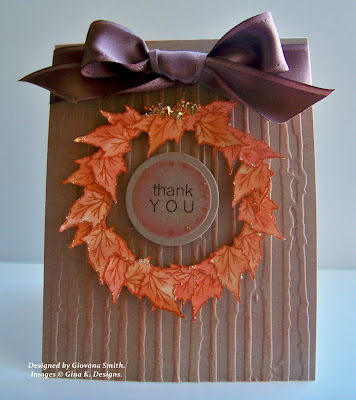 Thank you Giovana for thinking outside the box and reminding us all how much can be do with some classic, simple leaves! Since this card turned out different than I originally planned, I thought I'd go ahead and make up the sketch of it for you! Enjoy! If you make something with it, please let people know about my sketch with a link to this post and share a link to your card in the comment section below! It would also be great even if you can't participate to link this post on your blog to spread the word about the card drive, thank you in advance! If you live in or around the Austin area and love Copics, here is a GREAT deal for you! I have bought several markers from Jerry's Artarama, but they have loads of other art supplies too (if that's what you're into!) 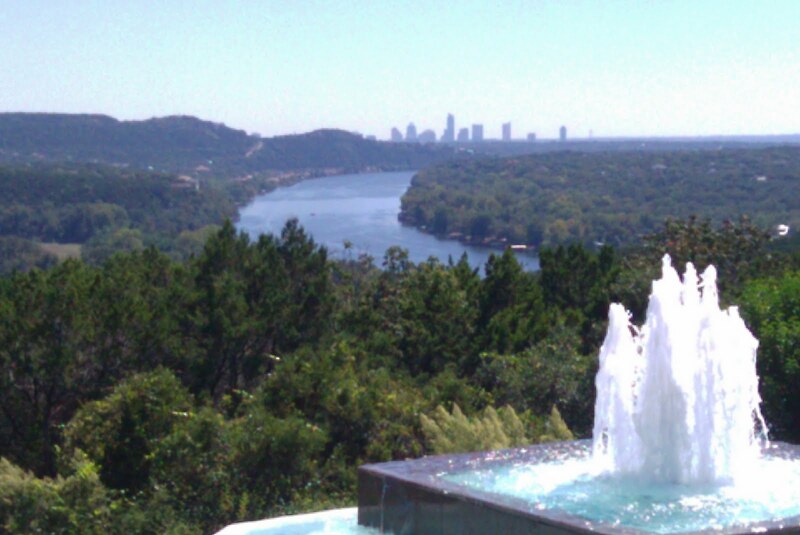 ;) the coupon is only good at thier brick and mortar location in Austin, not online, just so you know. I bought the limit of 2, which means I can get $90 worth of Copics for $38, wowee! (I already have all the Ciaos Gina sells but am still building my collection of select sketch markers outside those colors). buying the deal expires today, but you have until January to redeem it so don't delay! And Jessica Fick has put together a free download of all the challenges they have done during their term, what a great resource, thank you Jess for assembling! Didn't want to go though without leaving a pic so here is something to tickle your funny bone this Wednesday morning, one I snapped with my phone recently, just for you all! Oh, the memories that giant styling Barbie head on the top brings (1979, 6th birthday), her blond hair blowing back down the freeway is truly a sight to behold!! Yup, and you can bet I wasn't the only one who stopped to take a photo! We'd seen this car out twice the past few months tooling around town, I could not miss my opportunity to capture this stunningly original altered vehicle at a standstill! 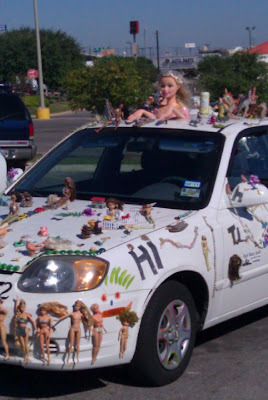 (If I should happen to run into them again I might have to leave a tiny bag of clothes and accessories for all these nakey dolls!) If you never been to Austin, this speaks loads about my city, lots of people eager to share their, um, individuality! (In my 19 years in Austin, this car so far is only rivalled by the Van Gogh Van (muralled VW van in the style of Vincent with sunflowers and self portrait fo him with one ear), the mirror car, and the Godzilla car!! (I'll try to get those for you too! I tell you they would make the best coffe tabel book and maybe I will just bite the bullet and do it one day! LOL!) ;) My silver Explorer is remarkably unoriginal, but I make my presence known in other ways, hee! Hi everybody! Just a quick shout out about the latest issue of CardMaker, now available! We have so much Gina K Designs represented in this issue, from many talented designers! Have to give a little special shout out to Jennie Harper who's making her first appearance in Cardmaker this month, woo hoo! She has the most gorgeous card in there using Gina and Theresa's sets, wow, I love it!! Here is one I created for it, love those Pure Luxury Buttons! Have a great day!! This week will be busy creating for our new release next week! I am so excited about my newest set we are releasing, can't wait, can't wait! Hello! Today I have a new "Buds and Vases" sample, this time just a vase but filled with some stick on paper flowers! Isn't that dimension fun? I got these little roses from Jessie Rone ages ago (source unknown! ), and have been saving them for something special, thanks Jessie! Paper flowers are always a hit on cards and the pots and vases in this set make for easy, eye catching arrangements! Now I didn't have any cardstock or paper that was an exact match for the flowers , which is probably part of why it took me so long to use them, but today I found a few things that would b-l-e-n-d. I started by stamping the vase and then drawing in some dark green stems to match the paper leaves under the flowers. TIP: To make extra leaves on the stems, press the brush tip of your Copic down onto the stem and give it a quick flip UP, the the left or right. After sticking the roses on, I finally found a Basic Grey Lemonade pattern that had LOTS of different colors in it with just some very small hints of a darker rose, not quite the same but close. All the other stuff going on in this pattern makes it work. Now the Passionate Pink CS I have was the closest match and I found that in the light the highlighted parts of the flowers do work with this brighter pink. Yay! The Fresh Asparagus I used was darker than my pattern paper and not quite as dark an my stems, but mixed with all these other brights and pastels and in between like this in just small amounts worked out, too. The softer Sweet Corn elements tone down these deep colors. Hello, and welcome to October's Gina K Designs Designers Challenge Hop! 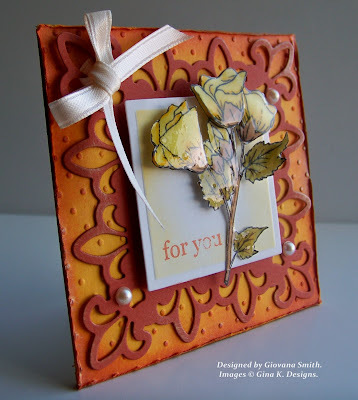 This month Gina invited us to create a card with one of your our favorite background techniques from the STV archives. I chose crayon resist. It was perfect for making white flowers with my "Buds and Vases" set and a darker, contrasting background to make them pop. 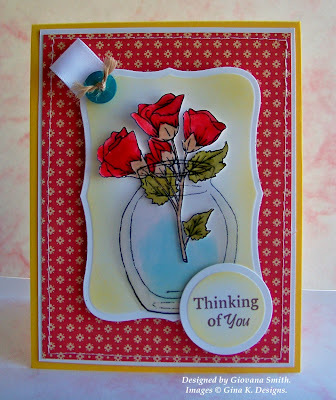 Stamp your flowers and vase on glossy cardstock and color in the flowers with a white crayon. Don't worry about them getting completely covered, I love the little scribble scrabble that peeps through after sponging the ink! After coloring the leaves with green Copics, I sponged over the whole image with Tumbled Glass and navy ink, then wiped the excess away from the flowers with a napkin. I used Janice's color challenge this week as inspiration, vase is pieced with Kraft, and mats are Grass Green, Ocean Mist (Cuttlebugged with Victoria and sponged) and In the Navy . Tera - our guest designer this month! Anyway, what a fabulous design for a wedding or anniversary! The script is the love chapter from 1 Corinthians and the roses add just the right touch of beauty and romance! Change the greeting, and the script with the flowers becomes a classic and elegant design for any occasion. 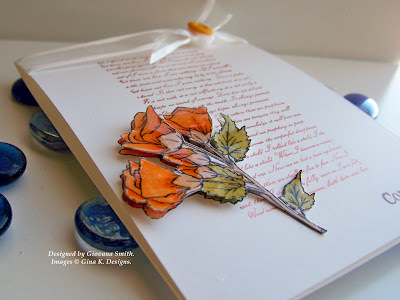 I love how she used colored ink to match the roses for the script instead of just black , using this block of script on the middle of your card is a terrific base for a single layer card, adding a "layer" without needing to mat or use dies! The popped up flowers with the colore version of the same image behind the cut ones add so much depth, and the placement of the button with the tied bow is perfect: your eye just travels down in a Z over the card left to right and back again, then ending with the greeting, Gorgeous, Giovana! 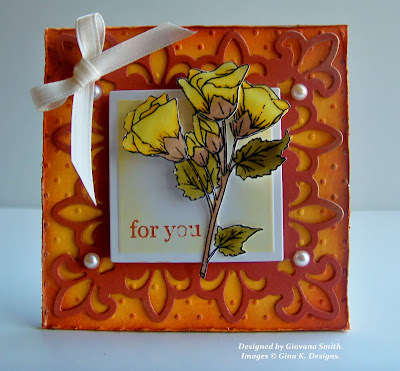 Coming up tonight, a blog hop with the GKD design team! What do you think this is?? Hello! I am going to be devoting more posts recognizing YOU my devoted readers! It takes a lot of time to read blogs and even more time to leave comments and I so appreciate all of you who do that, whether it's every day or only when you do find that time! Today I have a little Q&A and some samples made by Rebekka Read, reader and Gina K Designs Customer! Rebekka leaves the sweetest comments and has such an inspirational blog, I hope you check it out! Here is a terrific sample Rebekka recently uploaded to the STV gallery! Be sure you check out her fabulous creations here! And below this gorgeous embossed "Wild at Heart" card! Tell us about your own blog! I am a born again Christian, hence the name “A Diamond In the Rough” A Christian journey.. To share my experiences in Christ through paper crafts. Learning and growing in both my faith and creative gifts. Sharing thoughts ,ideas and experiences that we may grow both creatively and spiritually. How do YOU use all the inspiration you find on blogs? I take a little of this and a little of that. How many do you read a day/subscribe to? What do you especially like about this blog? 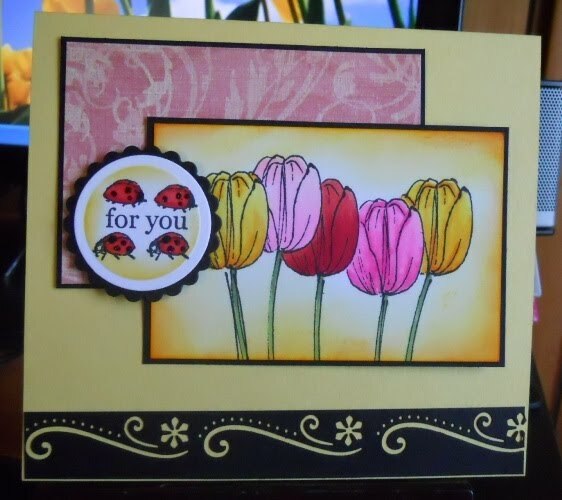 The creativeness of your designs, owning your stamps, it gives me inspiration for different uses. Do you have a favorite post or project that you’ve seen on my blog? Sept 26, the Buds and Vases Sneak Peek, love how you used these sets, year of the flowers which is one of the first sets I bought, gave me new ideas to use my set. Favorite things about Gina K Designs? Love the challenges and love the friends I have made there. Love the quality and versatility of the stamp sets. Ever participated in any of my contests? This is the first of many Reader Spotlights! Again, all your encouraging comments mean so much to me! 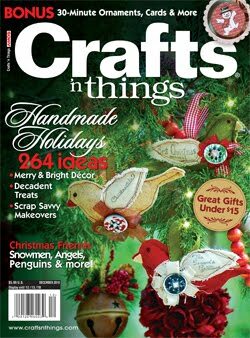 Let Crafts 'n Things® show you how to make the 2010 holiday season your creative best! Hand-crafted holiday cards and gifts, quick-and-clever ornaments and dazzling décor ideas abound in the December issue. Check out the Budget-Savvy Gifts section for a dozen handmade gift ideas that fit your budget and don't scrimp on style. You don't need to spend a fortune to make your loved ones feel treasured! Be sure to say "hello" to some of our cutest Christmas friends ever, including a houndstooth holiday bear, recycled sock penguins(my 8 year old really wants to make these together! ), festive snowmen to sculpt, stitch or sew, and, of course, a jolly St. Nick or two. Go directly to the top of Santa's "Nice List" when you give homemade decadent treats -- from heavenly cappuccino truffles to beautifully packaged chocolate chip banana bread(from the lovel y and talented Keri Lee Sereika), every morsel packs a dollop of holiday happiness (lots of Gina K Designs stamps spotted in this section! :) and I LOVE that not only do they show the packaging but they inllcude the recipe!!) Do you love decorating for the holidays? Discover the secrets to creating sophisticated holiday décor on a shoestring, then invite the girls over for a special night of Christmas cookie painting in our Girls' Night In spectacular. Creativity and food -- who can beat that?! And new this year, don't miss our special 30-Minute Ornaments showcase, I've actually made a list here of stuff I want to recreate! Whatever your style, you're sure to find at least one special addition for your tree. Happy Holidays indeed! 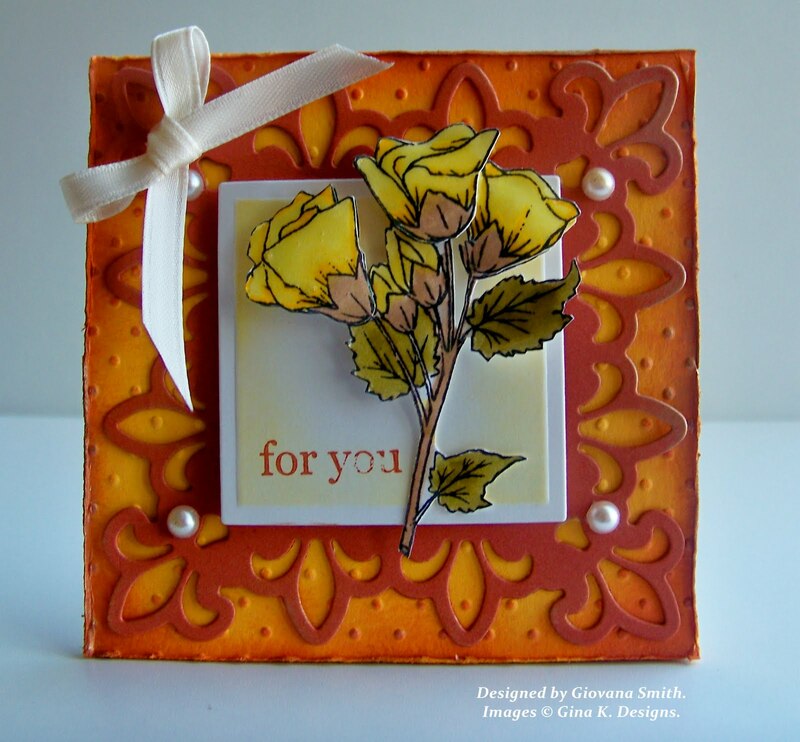 Please help me give a warm welcome ot my newest guest designer, Giovana Smith! Giovana caught my eye months ago with all the amazing cards she was creating with "A Year of Flowers", so I knew my "Buds and Vases" companion set when I was ready to release it would be right up her alley! She has a such a clean and classic style, terrific eye for color, and obviously REALLY loves flowers. (think she may be one of the current record for most times to use the rose, LOL! Be sure to check out her beautiful work with that set as well.) lt the magic begin! her first card uses the vase and roses spray, she actually cut the flowers and stamped the jar onot a piece of acetate to layer over them. Attaching acetate to a card can be tricky, but she cleverly hid her glue dots under the circle tag, hee! Way to work it AND create a beautiufl layout in the process! And don't thes ecolors just sizzle?! Love how delicate eerythign is here, the sewing and petite pattern, the little ribbon tag with button are all such sweet touches that complement the little branch. Hi, I am Giovana Smith, (sounds like: yo-va-nah). I am Peruvian, born and raised in my pretty small South American country. My first language is Spanish and I am proud to say I now speak English too :) I moved to America after I married my husband David in 2002. We have a daughter, her name is Rebecca and she loves to stamp with me and on occassion 'play' with mommy stuff. We don't own any pets, my husband and I have asthma problems and my daughter has several allergy reactions, so pets are not in our plans, however, little Rebecca has a snail she just named "Nelly", LOL. We live in Washington State, in a very country area, we are surrounded by the most beautiful farms. I am a SAHM, homeschool my daughter and also work at home as a baby-sitter. 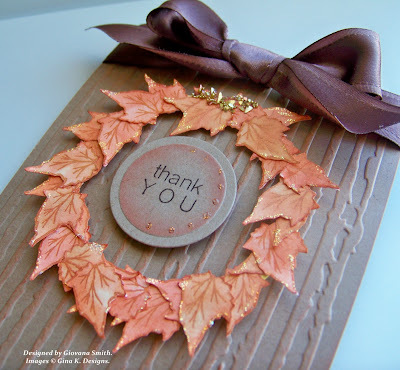 FAVORITE TECHNIQUE: Love sponging and embossing. COLORS/COLOR COMBO: My favorite colors are pink/brown, red/white, just plain white. FAVORITE EMBELLISHMENTS: Ribbons, pearls, rhinestones. FAVORITE GINA K SET BY MELANIE: It has to be "A Year of Flowers", that was my first set I got from Gina K. and I love it very much. FAVORITE GINA K SETS (FROM ANY ILLUSTRATOR): I love "Botanicals", "Blessed is the Season"
CRAFT SUPPLIES I CAN’T LIVE WITHOUT: Pure Luxury Cardstock, Scor-buddy, Paper cutter, glue dots, foam tape, etc. I’VE BEEN STAMPING FOR (HOW LONG): 4 years. Tell us about your FIRST stamping experience: Not too good. I tried to CASE a card I saw online and it didn't turn out the way I wanted, it was really bad, LOL, but after so many mistakes I learned so much. ADVICE FOR BEGINNERS: Always try your best, don't be afraid to try new techniques and never give up. FAVORITE THING TO MAKE THAT AREN’T CARDS: Tags and boxes. SOME OF MY STAMPING/CRAFTING ACCOMPLISHMENTS: Being part of several Design Teams. Being invited by Gina to be part of Center Stage Spotlight and also be published on Paper Craft Magazine and soon in a Swedish Magazine !!! 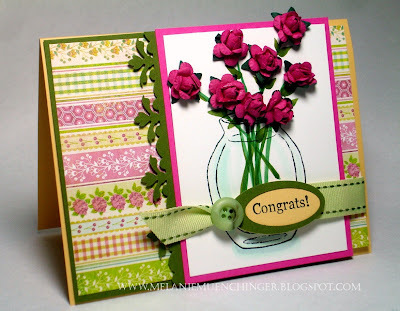 CHALLENGES I LIKE TO PARTICIPATE IN: I like the challenges from Stamp TV, CardPatterns, 2S4U, Stamping Sisters in Christ . TELL US SOMETHING ABOUT YOURSELF THAT MIGHT SUPRPISE US! I was an OB/GYN in Peru, now just a mommy who loves to make cards, and love it very much. 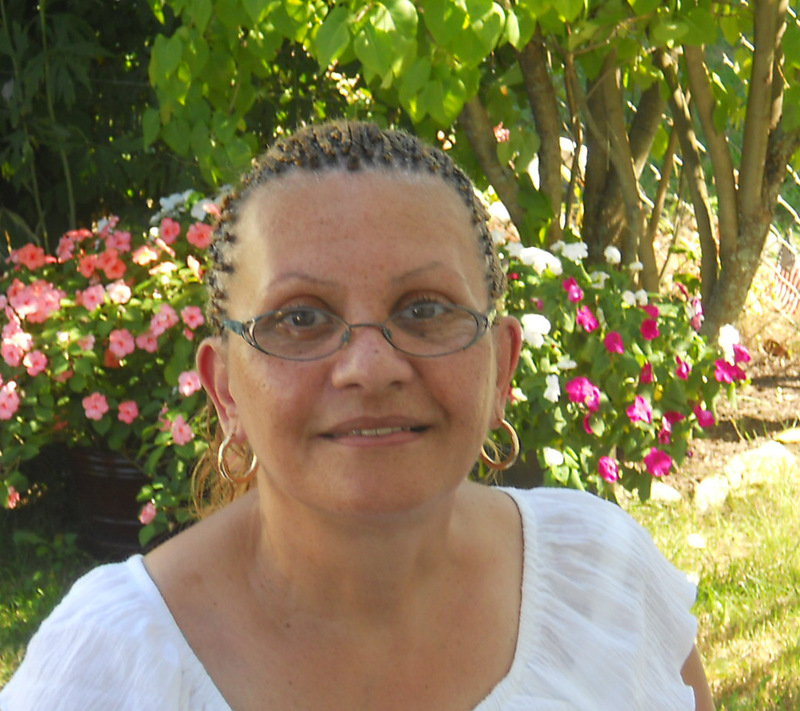 A FAVORITE QUOTE: "Never say I can't, because I know you can do it"
Please go visit Giovana today and leave her some love! Here is a card I sent to my guest designer this month, Giovana, her first guest spot will be posted this evening! 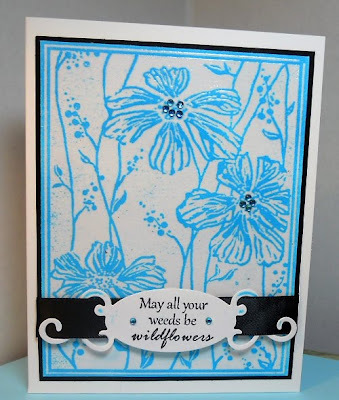 I stamped the flowers first, masked them and then stamped the pot on this large label die cut. Instead of using the whole label, I cropped the left side and tucked it under a piece of lace. I also inked up my embossing folder with some lavender ink before embossing, intentionally inking it up unevenly to have some parts lighter than others for a faded look. The individual cut flower gives the card more life, as though the arrangement just dropped a bud. I love how the pot turned out, I used Dull Ivory, Putty, Brick Beige, and Warm Gray No. 5 (Is it easier to give you the numbers, what is your preference?) I colored this before the release but I will be back to show step by step pics for coloring each. The dark and light areas stay the same if you have the light source coming from the right, so once you are familiar with these areas, it's just a matter of substituting different colors from your palette to make a terracotta pot, green pot, etc. I added a little peek of Sepia for the dirt and then just hand drew some Ocean Green lines leading to the flower instead of masking and stamping in stems. Shadow below is W-3. "Buds and Vases", the companion to one of your your favorite floral sets, is here! You won't find containers more perfectly suited for the style and scale of all the images in "A Year of Flowers" anywhere else! Three containers have been provided to hold all the buds in this set and your favorite assortment of blooms from "A Year of Flowers": an elegant vase for sophisticated cards, a pot for earthier creations, and a glass jar, like you just snipped some blossoms from your garden and put them in water on your window sill, for a sweet and casual, country feel! See above and below for some CAS designs using all the containers and flowers in the new set in a just a few easy combinations. Two new flower clusters plus a trio of stems have been provided, for adding to your containers, leaves and all, no masking necessary! I've also added additional bud and leaf elements from these same new flowers which have been separated to allow for creating single blooms, stamping matching floral background papers or borders, filling out your arrangements, etc. 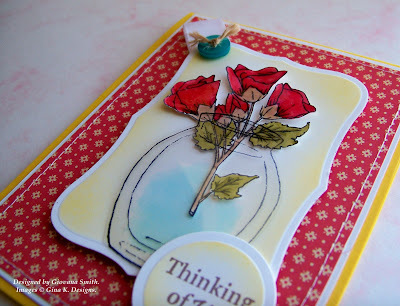 Use the flowers without the containers to embellish other cards, as a focal point or enhance your mats, greetings, tags etc. The clear containers can be used two ways: ink them up as they are and the images appear like they are made of glass, but ink up just the outline, omitting the reflecting areas in the middle and after stamping onto white colored cardstock you have opaque containers, like glazed pottery. More containers and bang for your buck! Just add color! Paper piece the containers to look like patterned china or a printed glazed pots. Use masks of the new flowers to stamp them into large full arrangements or to create long border and vines for your card, inside and out. Don't forget to decorate that envelope with a cluster of flowers. Make reverse masks by stamping out the images and then cutting out the inside. Now you can place the mask over your stamped image and sponge color into the space or stamp your favorite decorative elements. When you remove the mask, the container will be perfectly shaded or patterned. The flowering vine is clematis (here is one site for coloring inspiration), but their flowers look like SO many others in the plant kingdom, so they can be almost anything you like! Have fun coloring them any shade of the rainbow! Many step by step coloring tutorials will be provided. The simplest way to color is the color the entire blossom a light shade, then take a darker color and swipe out form the middle in quick strokes. Blend them for a softer, shaded look or leave a hard edge to give a striped petal look. You can create the appearance of a smooth flat petal with uniform color, or a more gathered, petal by taking a darker marker and starting from the outer edge of the petal making quick small strokes in toward the center of the flower which suggest folds and frills, see sample below. The clematis can be stamped at the top of the stems, or stamped lower and masked several times to cascade down the side. be sure to turn the stamp often, the cluster looks very different rotated 90 or 180 degrees, but every way is gorgeous! Stamping them in different directions on the same card will look like a natural random arrangement of different flowers, rather than the same static image being repeated over and over, see below, stamped twice in this sample. Add bling to the flower centers: pearls, rhinestones, glitter, Stickles, flock, Flower Soft, tiny buttons etc. Trace the flowers and leaves with glitter pens for extra sparkle. Each container can be cropped from the top or bottom to make a shorter or different shaped container. If you trim off the top or bottom, just make the cut curving parallel to the curve above or below it, then run a marker along the edge in the same color that you stamped the image in. Now it will look like that edge was drawn to match the rest of the image. Coloring the vase and jar: use pale grays or aqua to make a clear container that will stand out just a bit from your white or ivory background. Don't forget to go bolder sometimes and make the glass a beautiful color, green, blue etc, colored glass sparkles like a jewel! Give the glass a shiny, realistic look and feel by adding a layer of Crystal Lacquer or embossing with clear EP. Use the cracked glass technique with Versamrk and Ultra Thick Embossing Enamel to create a crackle glass vase. 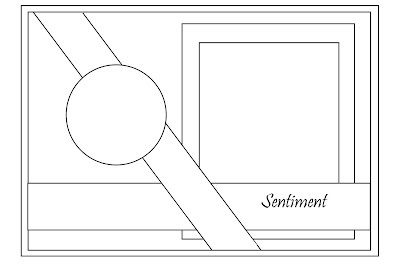 Stamp the containers onto specialty papers like glossy cardstock, vellum, acetate, foil etc. These will give some amazing shine and texture or the translucence of real clear of frosted glass! The solid colored papers in your Basic Grey packs are perfect for piecing the stamped pot, givign it a beautifully weathered, painted look. Add a little glue to the bottom of the vase and add some tiny rocks or clear beads like those gorgeous decorator floral arrangements you see in magazines! A jar is a very versatile stamp to have in your collection! Have fun picking through your other images to see what your jar holds: how about some shells from "Gifts from the Sea"? baked treats from "Have a Cookie"? A caterpillar from "A Year of Leaves"? Maybe a little fish? The list goes on, I'd love to hear which other sets or what else you'd stamp in the jar in the comment sections below! :) Be sure to stamp the vase first, then add your other images. Add some real buttons to the jar with glue dots. What about pebbles, twigs, beans? Get creative! The label (plus the small sentiments in "Labelled with Love" and "Lovely Labels 2" that fits the labels 14 dies is the perfect size to add to your jar and give it a homespun look! Perfect for making matching tags and cards when you are giving homemade jellies, bath stuff or any other fun treats in a jar! The simplest way to add the label is to ink up the outline of the jar only, then stamp the label over it. You can now cut off the sides if you want to cut the whole jar out or simply mask both straight sides of the jar with paper or Post it notes and then stamp the label. You can also stamp the entire jar, then stamp the label onto white or colored cardstock if you don't want to color,and cut out out adhere over the edges. Color the top and mouth of the jar with a grayish silver or gold and it will look like it has a lid. If your flowers and leave will be draping over the pot or container, stamp the flowers first, then cover them with a mask and stamp the container below. When adding the stems in an opaque container, a great way is to cut a slit in the top of the stamped container and thread cut and colored stems through. OR, create a mask of the pot or vase but cut out the very top of the mask image which would be the inside of the container opening. Ink up the stamp in the same way, omitting the top back rim and stamp. Place the mask over it, then stamp stems and flowers. 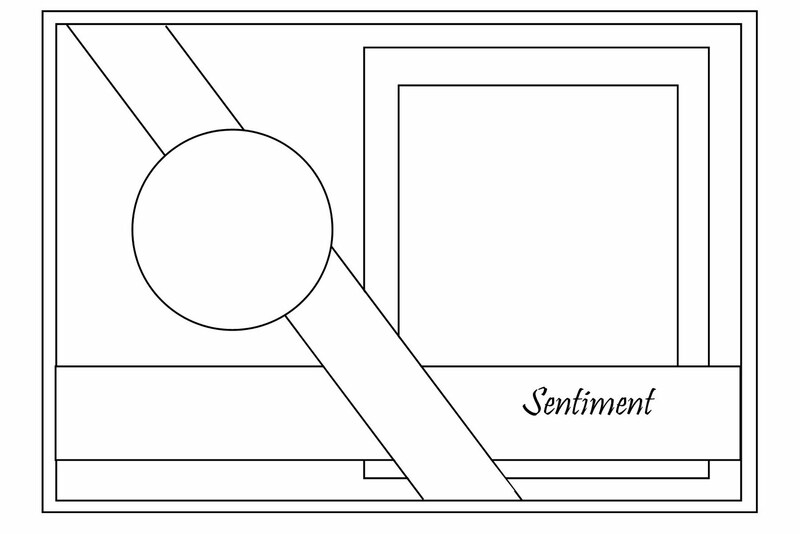 If you are adding the stems (or pencils or some other tall stamped image) to the clear vase or jar, you DO want to see the lines of the rim going over the image in the front but NOT in the back, SO ink up the jar or vase omitting that top rounded curve which would be behind the stems, and stamp. Now stamp the stems over it. Then take a pen and fill in the missing curve in between where the stems are (will show step by step of this on the blog) You may not even need to fill in that line if your flowers drape over the edge. Add dimension by cutting out the flowers and then popping them up over the top of one of the containers. Stamp some flowers to leave outside of the container for a more casual still life, as if the arrangement it still a work in progress. Stamp the small greetings onto a scrap of paper and trim to or die cut to make cut tag, then tie with some raffia, floss, help or narrow ribbon around the top of the vase. You could also tie a tag to the little bunch of roses. Add a pretty bow below the rim of the pot to make it look more festive and suit the occasion, think metallic for Christmas, pastel ginghams for baby cards, etc. Adhere the ribbon with glue, Scor-Tap or cut a narow slip on either side of the pot and thread the ribbon through so it actually looks wrapped aroud the container. Stamp the greeting directly onto the pot or container. On today's card, I wanted to create a cheerful mix of blooms and stems from "A Year of Flowers" to add to the jar from "Buds and Vases". This time I tinted the glass jar blue this time and I love the contrast of that with the yellow and pink flowers! DP is Basic Grey Lemonade, thought the plaid and floral patterns would look like a casual little arrangement on a table in a wallpapered kitchen. I like leaving some eaves or cut flowers near the vase like the arranging is still in progress! Die cut label underneath is from Lovely Labels 2, greeting is also from "Buds and Vases". Ribbon and buttons are Pure Luxury and card base is Green Apple. I'm sick right now, hoping to both be much better tomorrow! Oh, I'm so sorry, circumstances today prevented me from finishing up my tip sheet for you, and I don't want to post it prematurely without including everything I can think of for the new set! BUT in the meantime, here is a sample I created before our release which very coincidentally meets Cathy's Recipe challenge from our release, you have until Monday to enter for a chance to win a GKD set! Cat was pretty specific on this one: at least three bits of bling, one layer (but she said you could cut out and add your focal point to that layer), NO DP, and two rounded corners! I laughed out loud when she posted her sample and saw how similar her card and mine were! (I am a big fan, so guess I just want to be more like her!) I've made several cards with the different "Buds and Vases" containers resting on of the new label stamps, either from "Labeled with Love" (shown hre) or "Lovely Labels 2", will be shaking the others soon, and I love how they can look like a little doily, platter or placemat underneath! Flowers are masked and stamped twice, also added a couple additional stamped single flowers to make it even fuller and give more dimension, colored with Copics, centers are adhesive pearls, base is Kraft (edges swiped with Cream White pad to give if a softer look), label is stamped on Lovely Lavender, ribbon is Pure Luxury. Happy World Card Making Day! I actually had another project that needed my attention, which I will be sharing more about soon! and, it does involve card making! I hope you will all have a little time this weekend if you haven't already to participate in Cammie's "Heart to Heart Card Drive", collecting cards for the caregivers of patients with Alzheimer's (or if you don't know anyone personally , then for a caregiver at the Ardman Home where Carolyn's grandmother was a patient before she passed away in 2008.) You'll brighten someone's day by sending a card you made and you might even win a blog candy valued at almost $1000! Get full details on Carolyn's blog and see all the sponsors who donated and prizes included, you have until Sunday to enter! Here is a simple card I made for it with "Buds and Vases". I stamped just the inked up outline of the glass vase onto this cool black wood grained pattern paper from the Basic Grey Granola pack. The wood vase lent itself to a very minimal design with clean lines, so the lilies from "A Year of Flowers" made the perfect arrangement. Mats are White, Soft Sand (embossed with Herringbone), and Black Onyx. Greeting is from "Lean on Me", which I thought was perfect for the caregivers, who give so much to be there for the patients and their families. Have a terrifc weekend! Next up, my newest tip sheet!